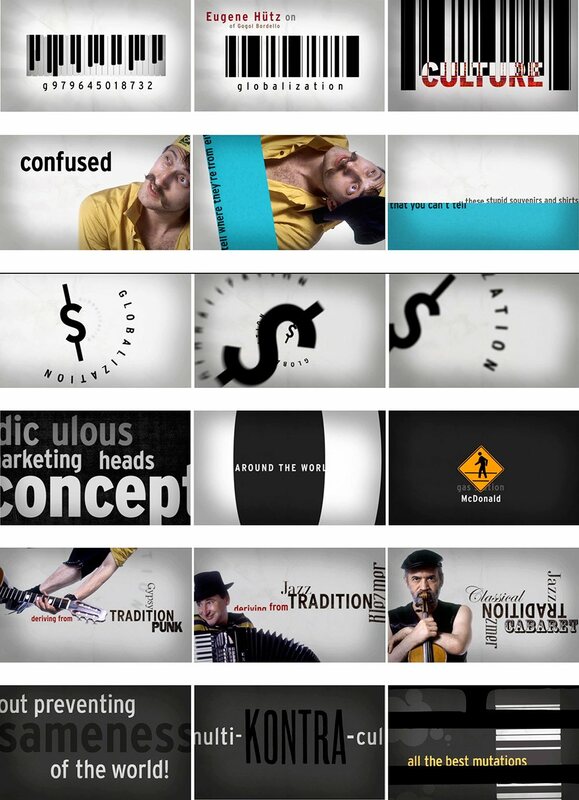 The “video manifesto,” as Lehrer calls it, begins with the black and white keys of an accordion transforming into a bar code as we hear the voice of Eugene Hütz saying, “Globalization… is a ridiculous marketing heads concept that helps sell things that people don’t necessarily understand. It’s basically killing the culture.” The bar code forces the word “Culture” (woven in a beautiful multicolored fabric) off the screen. The word GLOBALIZATION then appears, encircling a ginormous gyrating dollar sign. Lehrer and Sloan are founders of EarSay, an artist-driven non-profit arts organization dedicated to uncovering and portraying stories of the uncelebrated. Their projects “bridge the divide between documentary and expressive forms in books, exhibitions, on stage, in sound and electronic media.” Judith Sloan is an actor, writer, radio producer, and oral historian whose works have been performed and aired around the world. Her award-winning radio documentaries and audio essays merge reportage with music and sound art. “Video manifesto” animated and directed by Warren Lehrer. Soundtrack by Judith Sloan. Animated with the assistance of Brandon Campbell. Featuring the voice of Eugene Hütz. Accordion, Yuri Lemeshev. This video, directed and animated by Warren Lehrer with Brandon Campbell, features the words of Eugene Hütz—leader of the gypsy-punk-cabaret band Gogol Bordello—sharing his views on ‘globalization’ and putting forward an alternative vision of what he calls “multi-kontra-culture.” This animation, with sound production and arrangement by Judith Sloan, is an extension of Lehrer/Sloan’s multi-media project, Crossing the BLVD: strangers, neighbors, aliens in a new America, which documents and portrays new immigrants and refugees in the United States. Lehrer and Sloan were hanging out on a Lower East Side rooftop one hot summer evening, drinking vodka and sharing stories with members of Gogol Bordello, when Eugene came out with his critique of globalization and “multiculturalism,” and offered up a kind of extemporaneous manifesto of multi-kontra-culture. They liked his vision so much, they ended their book with it (W.W. Norton). Sloan mixed it with some street noise and the accordion of Yuri Lemeshev, also from Gogol Bordello, and made it the last cut on the Crossing the BLVD CD. That cut called “Globalization” is the soundtrack of this 4 minute 15 second animation, which Lehrer made in collaboration with artist/animator Brandon Campbell. The video was featured on slate.com, Print magazine’s online blog imprint, the Huffington Post, and other sites, and has become part of the Crossing the BLVD exhibition.